A young man in the front row at the History Center last week asked a perceptive question: “Where can I find a copy of that book?” he said gesturing toward the image of the 1863 edition of A Thrilling Narrative on the screen. That’s exactly the right question: What are the primary sources on this subject and where can I find them? “A Converted Indian Brave” in the Foreign Missionary 44-45, July 1886, 55-56. Anawangmani, Simon and Lorenzo Lawrence to Alexander Ramsey. Letter September 2, 1862, in A Thrilling Narrative of Indian Captivity: Dispatches from the Dakota War (2012) Appendix A, 201. Riggs, Stephen Return, ed. “Simon Anawangmani” in Dakota Grammar, Texts, and Ethnography. Washington: Government Printing Office 1893. 219-223. Sibley, H.H. to Alexander Ramsey September 11, 1862. Ramsey Gubernatorial Papers. State Archives, MHS. 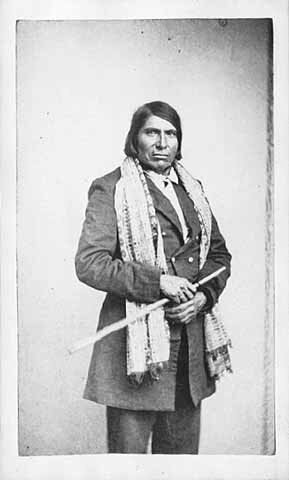 Williamson, John P. “Simon Anawangmani” and “True Hero of the Dakota Mission” both in The Word Carrier, vol. 20, no. 12, December, 1891. Microfiche, MHS. Manuscript and microfiche sources are available in the Library at the Minnesota Historical Society History Center in St. Paul, Minnesota. Printed sources are available through your local library and/or Google Books. This entry was posted in Simon Anawangmani. Bookmark the permalink. It’s very weird to see my great grandfather on this site.